A clay bath detox is one of the most commonly used detoxification procedures. Detoxification is a natural process of eliminating or at least reducing the amount of toxins, metals and other types of harmful elements from the human body. A clay bath detox can speed up the body detoxification process. While this type of detox is already popular in natural and alternative medicines, it is steadily making its way into traditional medicinal arenas too. Clay is known to be highly detoxifying in nature and it has excellent ability to attract toxins in the body. One of the main reasons for this is because clay is negatively charged while many toxins in the body (such as heavy metals) are positively charged. The common “opposites attract” methodology allows clay to absorb the toxins. Moreover, many people witness this phenomenon during a clay bath detox when clay clumps stick to the skin at areas where the toxins are being drawn out. This clumping of clay generally stops within 20 to 30 minutes. If the clay doesn’t come off by itself in this period, most practitioners recommend doing another clay bath at a later time to finish the detox process. Bentonite clay is highly recommended for a clay bath detox, as it is known to have the strongest detoxifying properties. Other low-quality clays will generally not be able to effectively pull out the toxins from the body. We recommend the Molivera Organics Bentonite Clay (a natural sodium bentonite clay from Wyoming). 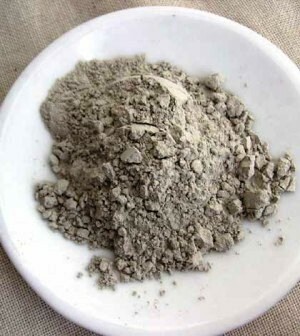 Or Aztec Secret Indian Healing Clay (a natural calcium bentonite clay from Death Valley, California). Both are 100% pure natural bentonite clay. A study was performed at Arizona State University in which bentonite clay was found to be very effective in killing Staphylococcus, MRSA, E. coli and other pathogens. Moreover, MRSA and other types of bacteria are not able to develop a resistance against this clay like they generally do with antibiotics. Mix 3/4 to 1 cup of pure bentonite clay in a large bowl of hot water. Allow this mixture to sit for at least 5 minutes. Fill the bath with warm water (a temperature that is comfortable). When the bath is full, you can either directly apply the clay to your body or mix the clay from the bowl with your bath water. Sit in the bath for 20 minutes or so, preferably no more than 30 minutes. All of these health issues are often related to some type of toxicity in the body. A clay bath can be an inexpensive and easy solution in helping to reduce the symptoms. Caution: If you are pregnant, have high blood pressure or any serious health condition, talk to your doctor before taking a clay bath detox. Ncbi.nlm.nih.gov; Broad-spectrum in vitro antibacterial activities of clay minerals against antibiotic-susceptible and antibiotic-resistant bacterial pathogens; 2007.